Here’s something I’ve learnt about motherhood. You can’t chase a toddler in stilettos. And that goes double for preschoolers on scooters. 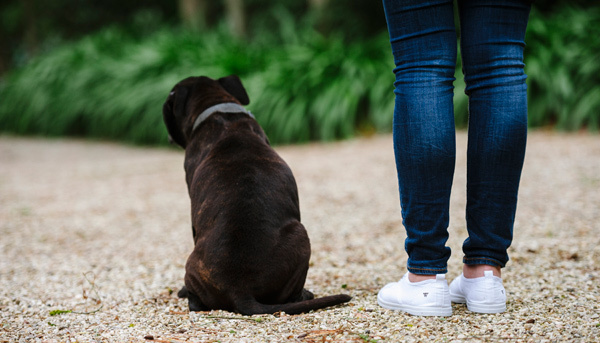 No, the only sensible option for mums who spend their days running around after kids – no matter how big or small – is to ditch the heels or leave them for more appropriate occasions and make flats your friend. I’ve been a mum for almost 10 years now, so there’s quite the stack of flats in my wardrobe, from sandals and thongs to low-heeled boots and way too many ballet-styles to even count. But what I’ve been missing for a while is some casual canvas flats. So when Walnut invited me to pick my favourite colours from the new season plimsole collection to put through their paces this month, I was happy to help. Now, I’m a Walnut fan from way back. I’ve been putting their canvas flats on my kids for years and their women’s ballet flats are a staple of mine too. 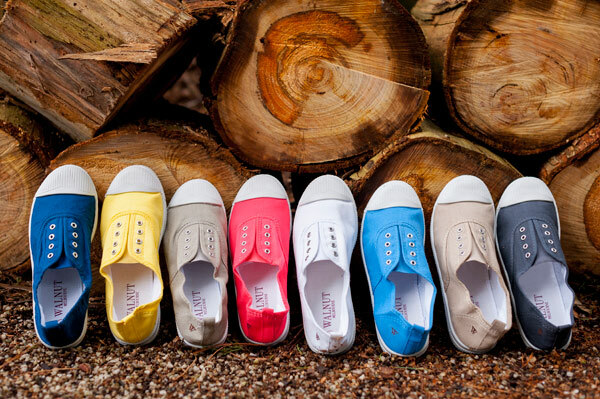 So I’m a little embarrassed to confess I didn’t think to try their women’s canvas plimsoles when I was on the hunt for a casual shoe earlier this winter. I wanted something to slip on with jeans and a tee for quick kinder pick-ups, after school swim lessons and the Saturday morning gymnastics run, but the streetwear brands I’d tried didn’t feel quite ‘me’. The Walnuts, when they arrived, were something of a Goldilocks moment – just right! Here’s the things I like about Walnut’s Euro plimsoles, things I think you’ll all like too. The eight new colours are fab. Whether you want a neutral palette or prefer your shoes to stand out, there’s something to suit. Walnut asked me to choose my favourites and I went with yellow, ink and midnight, though my daughter did her best to talk me into the brighter quince. Walnut were super generous and sent me all three. I love that the front of the plimsole is high enough that I can don a low-cut pair of socks underneath to help keep my toes warm – especially handy for those early morning school drop-offs. Can’t do that with my favourite ballet flats! What else? I love that I can jog behind my four-year-old while he dashes down the street on his Mini Micro scooter (sheesh, those things are fast!) 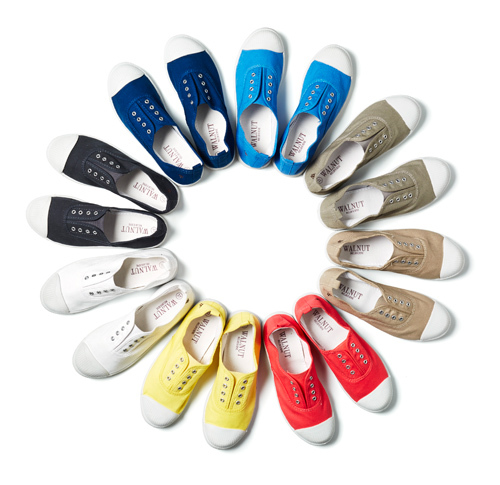 without the plimsoles slipping off at the heel, as ballet flats are also prone to do. This is where I should mention that I do have a pair of ‘proper’ runners, but I don’t ever wear them in public unless I’m in exercise gear and actually officially running! I also love that I can just slip them on and off in a flash – very important, because with three kids to wrangle, I always seem to be running late and don’t have too much time to fuss over myself. 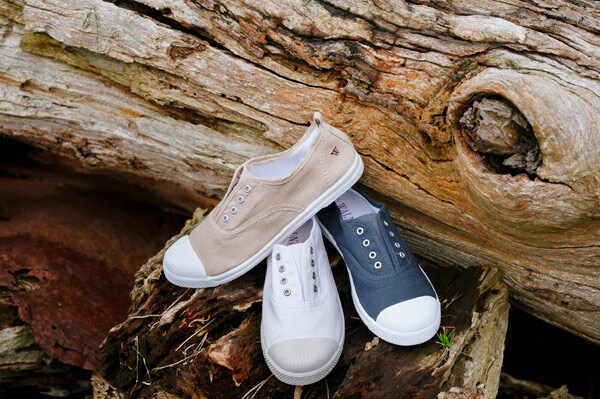 Plimsoles are effortless and look great with jeans. I can imagine that in summer they’ll look just as good with shorts or a skirt. I also like that the soles aren’t chunky and the rubber edged toes aren’t clownish, like some other canvas casuals, and that the logo branding is discreet. I’ve never much liked being a billboard for the brands I wear. Now I like the no-laces eyelet look, but if you prefer laces, Walnut have a casual canvas for that too. 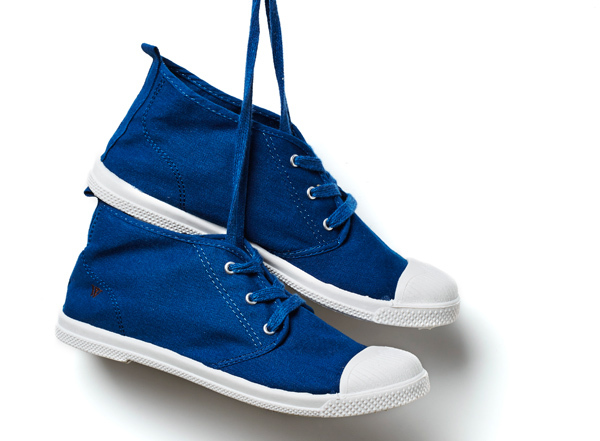 The Mid Top Europe plimsole has a higher top that sits just under the ankle. They come in three colours – ink, dove and white – and have drawn comments from other mums every time I’ve worn them to school or kinder pick-up. 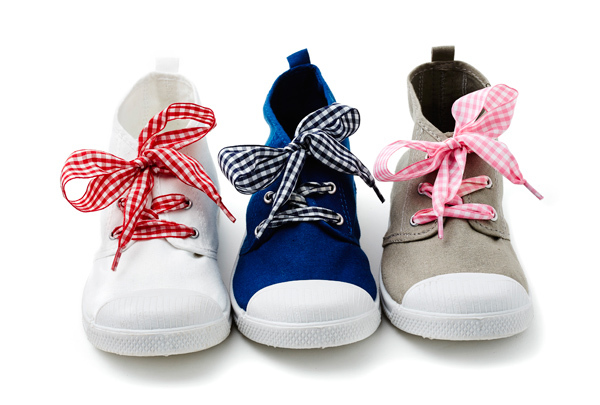 You can go with colour matched laces (above) or funk them up (below) for a shoe that really stands out at the school gate or playground. Walnut Euro plimsoles retail for $49.95 and Mid Top plimsoles for $59.95. Both styles are available direct from Walnut.